Final Warning - Hardware peripherals - Taking Care. You've got a new song from Sarah on MySpace! notification to facilitate your use as a member of the MySpace service. Tempting though it might be to click on the link to 'mysapce.mp3shect.com' - especially with the bait of getting several free mp3 songs as well, it would not be wise to do so. This scam plays on the fact that many people who use the Internet simply have no idea about how any of it works. The senders of this email hope that its recipients will see the 'myspace' and '.com' parts of the domain name and think that this is the real thing - not realising that 'myspace' is, in this case, a subdomain of 'mp3chest.com'. This gives you individual addresses that those domain names link to. You can see that the first three octets are completely different but that on its own does not prove that they are not linked. You can see now that the two are not related. It did, of course, turn out that this was just a phishing scam, trying to get the usual information from end users. It was, however, spammed quite aggressively and went out to many non-MySpace users. So, if you are unfortunate enough not to have access to a computer that runs UNIX, Linux, BSD and so on, what can you do with Windows? You can open up a DOS box and use 'nslookup' instead of 'host'. Buffer overruns can be seen in security updates most of the time. They happen when you have a buffer in a program such as in the top part of the diagram on the right which depicts a program with a buffer in it as a line of code in memory. Essentially, the buffer is just a space where input data can be stored so that it can be used - there are several types of buffer but this is essentially what happens with an overflow. You can think of the buffer as a compiled variable - say, in this case is it a string that can be a maximum of 1,024 bytes long. The program counter trundles along at its own pace, reading commands and executing them until it gets to the jump command at the beginning of the buffer. Then, it jumps to where the end of the buffer and start processing again. That way, the processor only ever processes commands and never tries to process what is essentially data. Many programming languages have no way of protecting themselves against tainted input and many programmers do not code with security in mind. This leads to a situation where somebody else could be using a program that they had written and they deliberately send your server a string that was, say, 1,536 bytes long. Without any checking of this, it would end up with 1,536 bytes being written into that variable. The extra 512 bytes replaces whatever is at the end of that variable, which might well be some program code - this 'data' will then be executed when the program jumps to the end of the buffer. With this in mind, some people craft the extra data as proper program code - ie, sending it machine code instructions so that your sever does what they want it to do - whether that is to crash your server (Denial of service attack, aka DoS attack); take it over so that they can use it to send spam; or, gain escalated privileges. In order to effect this, they will send long strings to a server until it breaks. Then, they will try to find out how it broke and then, they will have an idea of what programming they will need in order to do what they want. If that sounds a little far fetched, then it will surprise you to find out that that is what happens. So, whether you run Windows, Linux, BSD or anything else, in the updates you will often see patches for buffer overflows so it is worthwhile using them. Many times, you will see an email that will claim that you can remove yourself from a distribution list just by clicking on a link in the email. add you to a list of email addresses that can be sold on to spammers as an 'all verified addresses' CD collection. Therefore, I would say 'don't click on the link' - just delete it. In the UK, the Privacy and Electronic Communications Regulations (EC Directive) 2003 requires explicit prior consent to be given for commercial emails to individual subscribers. Many senders of emails will be sending them to addresses with domain names that end in '.com' but there are no limits to where these addresses will be and some will undoubtedly end up in the UK and therefore subject to the regulations. If you use BASH, you will know that you can see, edit and use previous command lines and also that you are not limited to the current session. If you have been using it for a while, there will seem to be a limitless supply of older command lines saved somewhere on your system. So, have you ever thought where this history is, just how large it is or even what's in it? The bash command line history is in a hidden file in your home directory called '.bash_history' (so, that would be '/home/paul/.bash_history' with changes for your login and your system (sometimes the home directory is in '/user', '/u' or '/users' or '/export/users' depending on the UNIX-like system that you are using) and contains the most recent 1,000 lines. You can see it's contents by typing 'history' at the command line or, if you are not on a graphical CLI, you can pipe it to less by typing 'history|less'. This is particularly useful if you are wondering what you typed in order to achieve something in particular a moderate time ago. So, if you have ever typed your password on the command line by mistake (perhaps thinking that you had already issued a command that was waiting for it), it will be in there as well. .bash_history is a plain text file so you can either search through it in KWrite, remove any offending lines and then save the file or just delete it. Most people would not argue that ASCII is without any limitations. The obvious choice when you encounter a limitation is Unicode which has all of our favourite ASCII codes plus a hell of a lot more. This enables people to use accented characters and symbols that you just don't find in ASCII. If you look in the files directory, you will find a file called 'unicode.html' and if you click here, it will open up in a new window. This page has been generated from a Perl script which you can find by clicking here. It is called 'unicodegen' and you can edit the values in it to produce your own unicode.html file. Your system should have Perl on it unless you are running Windows in which case, you can get it from ActiveState. The page is written so that no particular coding is used and as a result, you can specify which ranges of Unicode values you use and which font and so on. To change the encoding, just right-click on the page and select the encoding you want. This all sounds as though it is really useful but in the same way that electricity can be used to power your computer or an electric chair, there is a negative side to this as well. Many spammers and other senders of unwanted email deliberately use these codes in order to obfuscate the true identities of links in emails - thinking usually correctly that the user will not bother to check them out first. You will see, if you look at the source of the unicode.html file, that the codes from 32 to 127 can be written as Unicode values thus obfuscating their true meaning. In addition, some malicious websites use them in an attempt to get though filtering proxies that would otherwise filter out their pages. Remember: '%73%65%78' will sell just about anything. 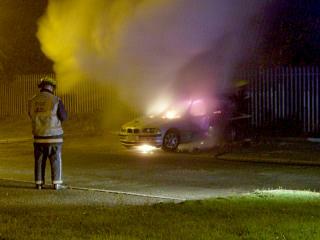 The image on the right is a genuine car fire at night (around 06:20am) and as such, is a mass of alkali metal emission spectra and interference patterns. However, it is not difficult to reproduce these effects. First of all, let's look at the flames and see why they are coloured the way they are. In the car itself, you can see flames that appear to be coloured but when you look at them closely, you can see that they are in fact white. It is the area around the flames that is coloured. Just in case you were wondering, they are really that colour. Normally, flames will appear yellow - primarily on, say burning wood. However, here, the environment is different. In the car, there are a number of gunpowder charges for the air bags. The only metal ions in gun powder are potassium. If you have a dusty gas stove and light one of the rings then bang the side of the cooker lightly, you will see yellow flecks in the flame - these are particles containing sodium. Sodium emits a yellow light and in the same way, potassium emits a lilac colour. In the flame, the electrons in the metal ions become excited and as they fall to lower energy levels, they emit light. We are dealing with a quantum effect here so the wavelength will always be the same for a particular fall from one energy level to another. The different energy levels that electrons fall from and to, together with the probabilities that a particular fall can be generated (ie, the electron has to get there in the first place and so on) determines the emission spectrum for that element. Why do different elements have different spectra? Because they have different nuclei and therefore the orbitals that provide the different energy levels will have a different size. So, how do we make one in an image? All you need to do is to mimic the over exposed area and the surrounding glow. This is simpler than it seems. First of all, create a mask, say by using the Bezier curve selection tool. Next, create two new layers. Select one of them and fill the selected area with white. Next, select the other, grow it, blur it and then fill it with the flame colour you want. 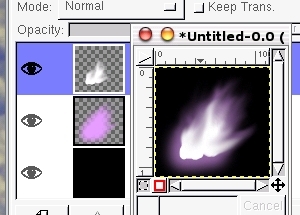 Next, use the smudge tool to spread out the flames and the glow as you wish - you should end up with something like the image on the right. Secondly, it is casting an interference pattern across the image in a series of feint, concentric circles that you can see if you look carefully at the image on the right (the top one is straight from the image and the bottom one is enhanced to some degree). You can get a pattern like this quite simply with the GIMP by editing a gradient pattern so that it has a sinusoidal blending function and then creating the grading fill in a new layer using a radial gradient, dragging the mouse over only a short distance and allowing the GIMP to repeat the pattern for you. 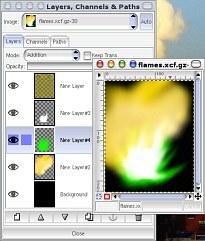 In files/flames/, there is a flames.xcf.gz file that you can see on the right. You can load this into the GIMP and have a play around with it. If you select the layer with the emission spectrum in it (green for copper in this case - pure, saturated green (#00ff00)), you can use the hue/saturation tool to change the element. If you have just migrated to a new machine, it is fairly likely that the last time you typed in your ISP account passwords was so long ago that you cannot remember what they were - you will need them so that you can access your email via your POP3 account and you probably won't be able to find that scrap of paper that you wrote them down on several years ago (not that you should have done that in the first place). Your passwords will be encrypted wherever they are stored on your hard drive so, unless you know a program that you can use to crack them, you have a bit of a problem. But there is an easy way. All you need to do is to load KNOPPIX into the CD/DVD drive of your new computer and plug the Ethernet connection into the back of your Internet router along with your old machine. Now, boot up the machine with KNOPPIX on it and it will load into your RAM without writing anything to your hard drive. Next, open up a root console and enter 'ethereal' -- the menus are pretty much the same as on Windows XP so they are fairly easy to find. The reason you need to do this from a root console is that you are going to listen in on the network which is a privileged action and normal users aren't allowed to do this. You should now have Ethereal up and running as root. Next, you need to capture the traffic on your network in what is called 'promiscuous mode'. Click on 'Capture' and then 'Options...'. In the Capture Options dialogue box, everything should be set pretty much as you would need it any way so just click on Start. Once all of this is in action, just run your email program and your password will be passed across the network in the clear. Ethereal will pick this up and you will be able to read it. Once you have sent/received your email, click on 'Stop'. Ethereal will now perform any calculations that need doing and display it similar to the display on the right. You should now be able to select a packet by clicking on it (look for one with 'POP3' in it) and then right-click on it and follow the stream. You should now get something like the one on the right, with the whole conversation colour coded so that you can see which machine is talking (this screenshot is from a different machine but it still uses Ethereal to do what is described above). If your mail connection is encrypted, you should be able to select an unencrypted version to do this with but once you have your passwords, you should then be able to change them to new ones - something that you should do straight away. When spell checkers originally came out (my first one was for the Sinclair QL in the mid 1980s), they were deemed as the end of people being able to spell. As word processing on the PC became something that happened whilst you were typing rather than something that happened at the end, it became a game that you would deliberately spell a word correctly so as to spite the spell checker - every correctly spelled word was a battle won. However, spell checkers are not complete. Unfortunately, English is comprised of many ways of saying the same thing - it is manifestly clear that this is patently obvious - if you get my point. As a result, when you add up all of the variants of words that we use, the total runs into several million words. In everyday language, people tend to use around 40,000 words which means that they are only ever likely to use around one per cent of a truly complete dictionary. Looking at it another way, you will have all of that memory sitting there, with data in it and only around 1 per cent of it will be used. Of course, you could argue that as almost everybody completes all of the word processing work that they are ever likely to do by using only 1 per cent of the capabilities of a word processor such as MS Word, this is already a principle that is accepted. Another way of looking at it is that with so many ways to type in the wrong word, the end-users will be spoilt for choice when it comes to selecting the right one. 'appliance' instead of 'application' (thank you Zanussi); and, so on. 'Periodic' as in 'periodic acid' and 'periodic table'. Periodic acid is a 'per' acid containing iodine and is pronounced like 'pear I ode ic' whereas the periodic table has a resonant nature and describes how the properties of elements are defined by the outer shells of electrons going repeatedly through a cycle from metallic (ionic) properties through to halides (covalent) and then to noble gasses, then around again. Another is 'unionise' as in: to enrol a group of employees into a union ('union-ise'); or, to stop a substance from being ionic (such as vaporising hydrochloric acid - this is only an acid (and ionised) when it is in a solution, when it is in the vapour state, it is a covalent gas) (un-ionise). Being stuck with a semi-literate user population that is influenced by Americanised English and likely to click on the first alternative spelling they see because they don't know any better, the best you can do when you have installed your new word processor is to write a document that you know contains all of the correct spellings for your own field of work and then add them to your custom dictionary. Sometimes, if you are trying to find out what information is being exchanged when you connect to a http server, clicking on document properties in a browser is just not good enough - at best this only gives a summary of what actually occurred. Even wget only saves the file that was requested and whilst it keeps the original file's date/time stamp, it still only saves the file and optionally a log which still might not provide the information you need. Curl is a client to get documents and files from a server (although it can send them as well) and can work with a number of protocols. To see a full ascii trace dump to STDOUT, use the '--trace-ascii' switch and to see more of the data that is exchanged between the client and the server, use the '-v' option. If you have hundreds of thumbnail images to create or you want to update a collection of thumbnails automatically using a program such as a Perl script, you need a program that does the job perfectly (none of that messing around with GUI program rubbish - we're talking about good old efficient command line stuff here that you can get your computer to do for you without any supervision using a crontab at 4am on a Sunday morning). So, you have your photographs - say they all start with 'sa' as they do in the screenshot - and they live in the directory you want them to be in. ...to make a subdirectory for the thumb-sized copies you are going to create. (it doesn't have to be called 'thumbs', you can call it anything you like). You can type 'l' to see the listing of the files. ...to go into it. If you type 'l', you can see your files. to create your small images - note that this overwrites the originals in the thumbs directory (which is why we copied them to here in the first place) although you can use options with mogrify to make it write new ones. If you just type 'l' again you will see the file sizes of the new files. In the Konqueror file browser, you can right-click on an image file and click on properties. Under the 'Meta Info' tab, you can see the dimensions for the new image as being 100 x 75 pixels. In the screenshot on the right, you can see just from the file sizes that the new files in the 'thumbs' directory are a lot smaller, having been processed by mogrify. Just to allow you to see the sort of quality you can get from this program, I have assembled a web page of the thumbnails that you can click on to show the original it was derived from in the window below on the page. Just click here to open it up in a new window. You can, of course, write a Perl script that not only mogrifies any new images that you give to it but also updates a web page that displays them - see the 'unicodegen' file mentioned above. If you've just bought a new computer and wonder how long you should leave it before reformatting the old one then you shouldn't put too much weight onto the MTBF value - especially when deciding that the new one has been going long enough for you to be confident enough in it to format the old machine and use it for something else (such as a home network file server). There are a number of things that can make a new computer (or anything for that matter) fail at a given time. At the beginning of its life, it is most likely to fail because of poor workmanship or material defects - this is given the poor-taste name 'infant mortality' (yes, honestly). As time goes on, parts start to fail because they wear out - the time between these two types of failure is called the 'useful life'. You can see from the diagram on the right that the resulting curve from the sum of these effects has the shape of a bathtub and is actually called the 'bathtub failure model'. Infant mortalities are (or at least should be) unacceptable for the companies that build computers because they produce the 'dead on arrival' stories that we read about so often in magazines. However, it is fairly easy for a company to remove these failures to a large extent by 'soak-testing' them (aka 'burn-in') once they are built. This soak-testing should take the computer through a large portion of the infant mortality period and hopefully, the end user is sold a machine that will not fail until components wear out some years later (hint: look at the length of the warranty for a clue as to how long this is). The MTBF is the 'Mean Time Between Failures' and is often misinterpreted as the amount of time it will take for a component (such as a disc drive) to fail through old age. The MTBF applies to the normal life (roughly flat) part of the curve and is 1/failure rate. As a result, it can have values of 500,000 hours whereas the hard drive will have worn out through old age well before the end of this 57 years. A MTBF of 500,000 hours only means that 1.75 per cent of your drives will fail each year during the 'useful life' part of its use. Long before the 57 years is up however, the wear-out failure mode soon becomes dominant with its own, higher failure rate. It would, in all honesty, be more useful if the manufacturers gave you the time that the wear-out failure rate overtook the normal life failure rate as this is when you want to budget for replacing machines. So, is there a set time when you can reformat your old machine? No is the answer. All you can do is to make sure that you have an additional backup (remember that it is not a back-up unless there are two copies) of your data and keep the old one going until you feel confident that all of your favourite programs work on the new one. Many years ago, Windows file systems used FAT (File Allocation Table) and over the years, Windows grew and grew, as did the hard drives. One of the limitations of FAT is that there are only a certain number of files that you can save (as there are with any file system although the number was lower with FAT) and as the storage devices get bigger, the clusters (effectively a number of contiguous blocks that forms the smallest usage of disk space a file can have) grow out of all proportion (a 64kByte cluster to hold a 100byte file). In effect, most of the drive space is wasted if you have a lot of small files. So, if you have a lot of programs and each needs a small configuration file (some of this data might be values relating to the position on the screen of a window and some of it might be important information that is critical to the running of the whole system and only the admin account should really have access to it), you are soon going to run out of space. The solution to this (or at least the most rational explanation for this) was the creation of the Registry. This is a single file that can store all of the really important information that the system needs in order to function properly as well as that equally important information of where on the screen the minesweeper game was when it was played last. Why are these equally important? Simply because either of them can corrupt the other's data simply because it is all stored in the same file. So, file systems move on and now, we have some systems that will use single blocks (usually 512Bytes) rather than clusters of them (for example, a 2.1GB HDD with FAT32 will have 4kB clusters so a 1 byte file will take up 4kB of disc space and on average, 2kB will be lost for each file that is saved). However, there are some things that file system developers can do to make file systems more effective. Some file systems will nominally divide a block into a number of divisions so that the last block used can have some of the space used by files that are less than a block long (actually, if you have 4 sub-blocks in a block, you can only save files that are less than 3 blocks long in this way if you think about it). NTFS partially supports block sub-allocation so it is getting part of the way there. One thing to note is that if a file is more than one block long, it has been found to be more efficient if that file starts at the beginning of a block (as in the diagram) - the end can still be packed if the file system's disc utilisation allows it. One limitation is that if you only have 4 sub-blocks per block, you can only store 4 files in each block. A further improvement on this is 'tail-packing' where effectively the minimum sub-block size is 1 byte. In this way, if your block size is 4kBytes long, you can store 40x100 byte files if you want. This is the most efficient as you can read many files at the same time if they are all in the same block - such as a load of gif files in the case of a web server or a load of config files. Tail packing is used in ReiserFS and in Reiser4 thus making them fast and efficient - suitable both for home machines and web servers. So, if the Registry is, in effect, a single point of failure, why are we still using it? When cheaper printers break, it is often easier (although environmentally reprehensible) to replace the printer. However, if you have a good quality office printer, you could well be looking at a machine that is getting on for 10 years old. In the bathtub failure model (see above), a machine that is this age is clearly starting to wear out and might not be picking up sheets of paper as easily as it used to. However, not all is lost. Cleaning older printers is often more like gardening than IT - there are piles of dried out ink and snow drifts of paper powder as well as loads of dust. In addition to this, the rubber that the wheels are made from is approaching the end of its useful life (might only be another five years in it so get saving for your next printer). There is, however, one wheel that is more important than the others and that is the one that takes up the paper. 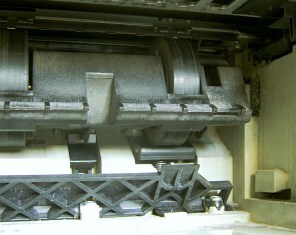 All you need to do is dismantle the front of the machine (with this Hewlett Packard, it is just a matter of reaching under the front of the paper delivery unit at the front and squeezing a pair of levers together sideways then pulling the unit out), exposing the wheels as in the photograph. Next hold down the form feed button. You should be able to see the wheel as the one with all of the extra levers and springs on it. Whilst it is moving, push a wet kitchen cloth up against it several times to remove the gunge (although you should be ready to pull the plug on it should something go wrong such as you get something trapped in there - remember that they are strong). Don't use anything stronger than water because this could damage the rubber. Reassemble the printer and it should work better. You could get another five years out of your printer. Workstation peripherals such as drinks and bags of crisps are without doubt essentials - how else could we computer programmers and journalists maintain our stereotyped figures? If you are in the habit of leaving your orange juice in a mug next to your computer so that - like your work - you can come back the following day to complete it, always look in it before you drink it, or better still, just throw it away. 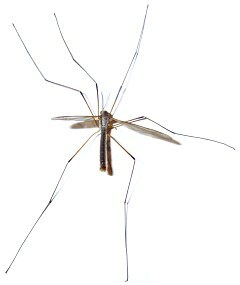 Otherwise, you might end up drinking some hapless insect (such as a Cranefly) as I nearly just did. Who said that computer journalism wasn't dangerous?